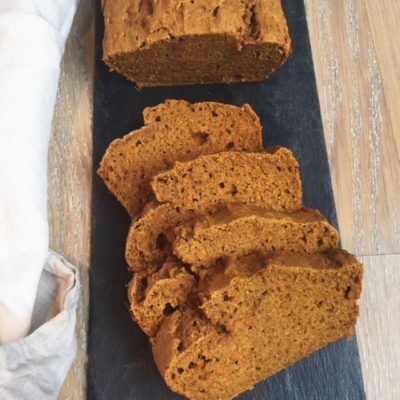 And to celebrate, I wanted to share three new pumpkin recipes with you. 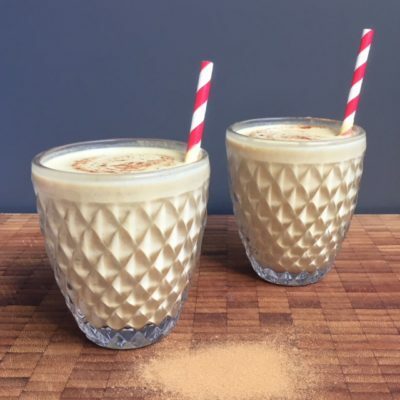 Fall’s signature ingredient is versatile, delicious and packs a serious health punch. That gorgeous orange colour comes from beta-carotene, which is converted to vitamin A in the body. This powerful immune booster also protects your skin and eyes. Pumpkins are also a good source of fibre. Below are three new autumn-licious recipes. Add ingredients in a blender. Blend until smooth. Arrange vegetables on a large plate. 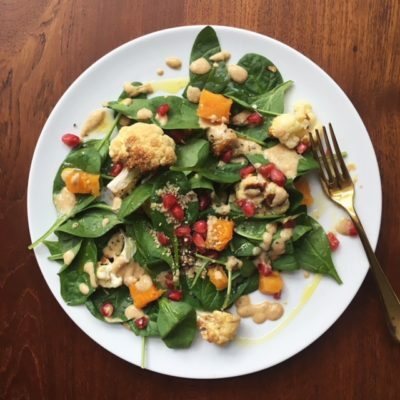 Drizzle with tahini dressing. Sprinkle with hemp seeds and pomegranate seeds. Add the apple cider vinegar to almond milk and set aside for 5-10 min. In a large bowl, beat the coconut oil and maple syrup. Add the eggs one at a time, whisking until blended. Add the pumpkin, almond milk and vanilla. Whisk until blended. Set aside. In a separate bowl, mix together the flour, baking soda, salt and spices. With a wooden spoon, stir in the dry ingredients until combined. Pour the batter into your loaf pan. and sprinkle lightly with cinnamon. Let the bread cool in the loaf pan for 15 minutes. Transfer loaf to a wire rack and allow to cool completely before slicing. 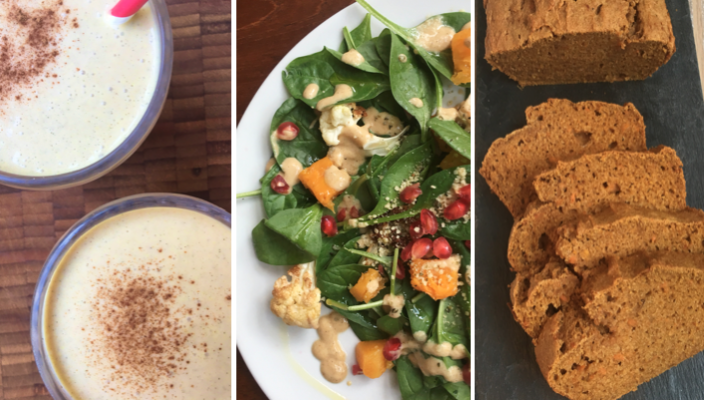 If you make any of these recipes, I’d love for you to share it with me on social media. Tag me @anacalexandre on Instagram.